After adopting my Poodle Sophia (a little over three years ago), I was very determined to make things special for her. I wanted to make bath time just that. Bath time was going to be spa time! Living in a rural area, puppy spas are not readily available. So I brought the spa home to her. We have been doing the spa for a while and add different things as we go. At this point, here are my home spa essentials. Bright towels;mine are not expensive. Target and Wal-Mart have nice bright colors for about $4.00 each. We use plenty in one session. I have them in a variety of colors because I have both girls and boys to do spas with. Special shampoos and spritzers make spa time more special and fun. It’s important that you pick a product that you like. 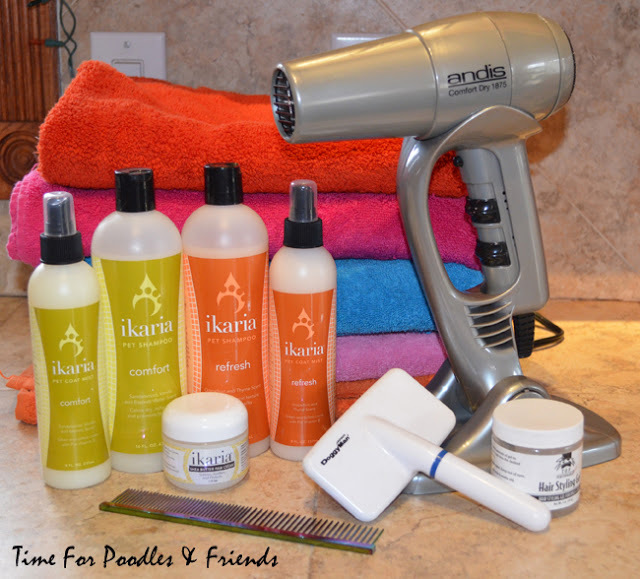 At this time I am using Ikaria products. When I purchase, I get the matching spritzer. The two I have are Refresh (a grapefruit/thyme scent) and Comfort (a sandalwood/vanilla scent). A few years ago these didn’t get very good ratings from customers. But I think the company has reformulated them and I have no problem with their products at this point. I’m looking forward to trying Renew. It features the fragrance of ylang ylang, which I love. Until this summer, I just used my hand hair dryer for the comb out. I decided to get the Andis Ionic/Ceramic dryer that has a five-position stand. It's $34.95 price was very reasonable for my home spa. My hands are now freed to brush and comb all I want. Then I have some extras. Ikaria’s Shea Butter Paw Crème is a product I like. If for nothing else, my dogs get use to me handling their feet. Has it helped their tolerance of foot trims? I’m not sure about that. My Mountain Fiest doesn’t even need trims, but I try to give him his paw spas also. A good brush, a greyhound comb, and some styling gel finish the picture. Who do I order from? I use PetEdge. I like their prices. PetEdge is set up for professional groomers but they have no problem selling to individual pet owners. Unless you order $150, shipping is about $15 per order. I keep my orders to about two a year and so don’t mind the higher shipping. Going in with a group of people would be a great idea. Click here for PetEdge's website. 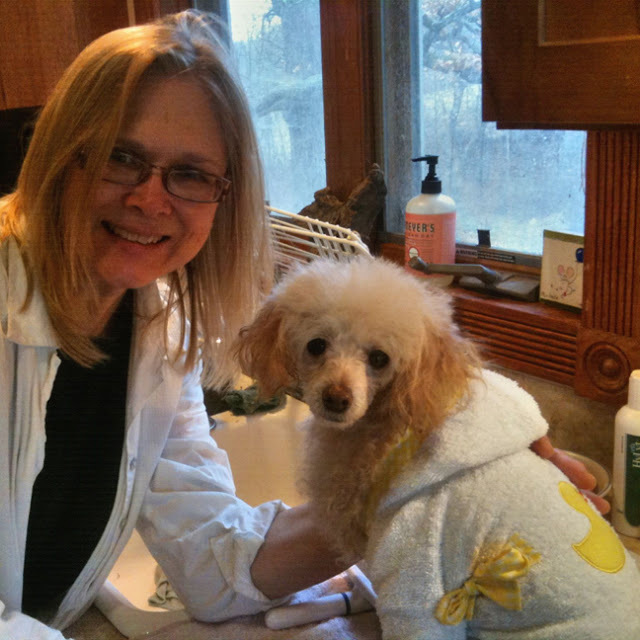 Enjoy bath time and let me know how you make your pet's special. Considering the price of quality grooming-this is a wise investment! I like to use car detailing products. They come in different colors and super absorbent fabrics and mitts to wash the dogs in. I use one color for the animals and another color for general cleaning. I also like to keep things simple. I like mane and tale products for daily cleansing and conditioning. I like the bravura cordless for quiet efficient operation. I like to use insulated totes to keep my precious tools in.$12 is a good bargain and easy to spot with a purse organizer for a clipper set,trimmer,scissors,nail clippers.I also use a spare insulated tote as a feeder bag of emergency food supply-and treats-this has come in handy in the past. Thanks for your input. I appreciate it. I have a large fabric caboodle that is hard to describe. It has a lot of compartments and zippers. But, the box that my clippers came in is getting ragged. I do need something new for them. And I would like to have a way to keep all my extra clipper combs and blades together. I have two Poodles now. 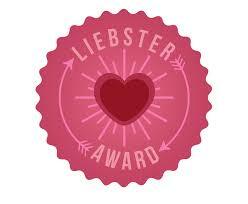 And, you are right, it was one of the best investments I could have made. Someday, I need to do a blog on my clippers and the book that I taught myself from.